The Texas Volleyball team topped visiting SFA in the first round of the NCAA Tournament Thursday (Photo by Jose Mendez/Horns Illustrated). 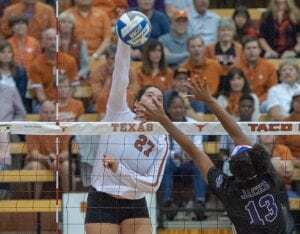 AUSTIN – It was hard to consider the Texas volleyball team’s NCAA First Round match against Stephen F. Austin as anything more than a maintenance outing for the fifth-ranked Longhorns. That, and a chance to beat up on someone other than themselves to begin the postseason. Texas could have taken it easy on the Ladyjacks, but – to their credit – they didn’t. 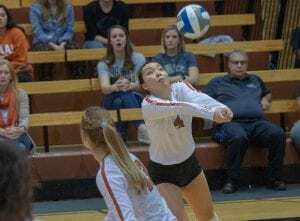 Instead, Texas used a laser-like focus to swamp Stephen F. Austin 25-14, 25-17, 25-21 at Gregory Gym and advance to the second round of the tournament while barely breaking a sweat. Texas (21-4) has still never lost in the first round of the NCAAs and is now a perfect 32-0 in the round of 64. The Longhorns will face second-seeded Texas State, the Sun Belt Conference champion, on Friday at after the Bobcats defeated Rice in four sets in Thursday’s other First Round game. “We are excited to be moving on to the next round,” said Texas coach Jerritt Elliott, who was voted the Big 12 Coach of the Year for the sixth time, the first since 2014, this season. “As a staff you have to be ready for some nerves, and how you handle your emotions in this environment is a big part of this. To win 3-0…I’m happy about it,” he said. Texas will host another postseason round Friday following its win over SFA on Thursday (Photo by Jose Mendez/Horns Illustrated). The Longhorns (21-4) entered the postseason on a 10-match win streak in which they were only taken to five sets once and posted six sweeps. Texas won its 11th Big 12 title and second-straight this season, earning its 24th conference titles (13 of those in the defunct Southwest Conference) all-time and seventh in the past eight years. The Longhorns’ record in the run-up to the postseason paled in comparison to the regular season produced by Stephen F. Austin, which carried a nation-leading 29-match winning streak into Thursday’s game. The Ladyjacks, who went undefeated in winning the Southland Conference, were making their first NCAA appearance since 2006. But Texas’ wins were against a schedule ranked the toughest in the nation this year, and the Longhorns’ experience, size and overall talent overwhelmed the Ladyjacks. Texas advanced to the second round of the NCAA Tournament by beating SFA Thursday at Gregory Gym (Photo by Jose Mendez/Horns Illustrated). Jhenna Gabriel dished out 38 assists and Sydney Peterson and Claire Hahn recorded 17 and 12 digs, respectively, to lead Texas. The first game was tied at 8-8 before the Longhorn reeled off eight of the ensuing nine points to assume a 16-9 advantage. Three kills by Eggleston highlighted the run. SFA found some momentum and pulled back to within 18-14 after a kill by Mackenzee Hanna, but Texas responded by winning the game’s final seven points as White ripped three kills and a pair of pressured attack errors allowed the Longhorns to finish off the set at 25-14. 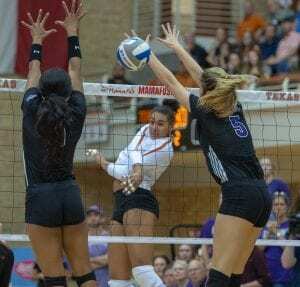 The story was much the same in game 2, as Texas asserted itself in the early going, allowed the Ladyjacks to close to 15-12 and then 21-16 and then rolled to the win at 25-17, with the final point coming on a ringing kill by Bedart-Ghani. The Longhorns outhit SFA .375-.065 in the set, with Eggleston (six kills on 12 swings) and White (4 of 10) leading the way for Texas. Stephen F. Austin (32-3) played its best in the third set, leading at 8-7 and closing to within 18-17 on a kill by Haley Coleman. Texas scored five of the next six points to go up 23-18 before closing the match on a service error from the Ladyjacks, winning 25-21. Texas swept Texas State on Sept. 6 in Austin and after the way the Longhorns dispatched SFA, it would likely take a miracle, or a huge Texas step back, to expect anything different this time around. Still, Elliott stuck to the party line after the match, saying he was wary of the Bobcats and was expecting a different challenge. The Longhorns square off with Texas State Friday back at Gregory Gym (Photo by Jose Mendez/Horns Illustrated).